IN ITS 10TH ANNUAL POLL, Moneysense Magazine ranked Whitchurch-Stouffville 124 of 209 Best Places to Live in all of Canada 2015 – this is the town’s first entry on the list, which evaluates multiple factors before adding a city or town. 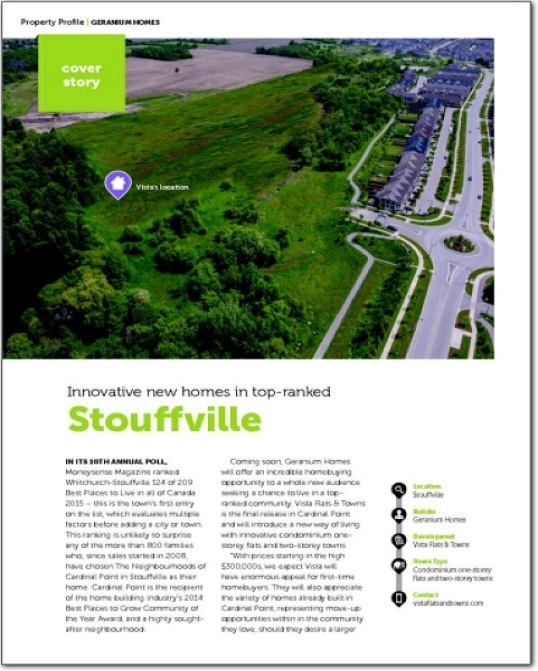 This ranking is unlikely to surprise any of the more than 800 families who, since sales started in 2008, have chosen The Neighbourhoods of Cardinal Point in Stouffville as their home. Cardinal Point is the recipient of the home building industry’s 2014 Best Places to Grow Community of the Year Award, and a highly sought-after neighbourhood. new audience seeking a chance to live in a top-ranked community. Vista Flats & Towns is the final release in Cardinal Point and will introduce a new way of living with innovative condominium one-storey flats and two-storey towns. 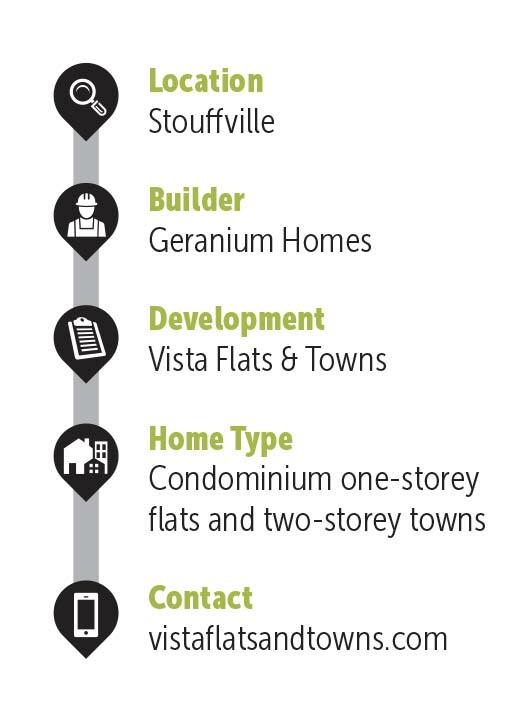 “With prices starting in the high $300,000s, we expect Vista will have enormous appeal for first-time homebuyers. They will also appreciate the variety of homes already built in Cardinal Point, representing move-up opportunities within in the community they love, should they desire a larger home down the road,” says Stephanie Lane, marketing and sales manager. 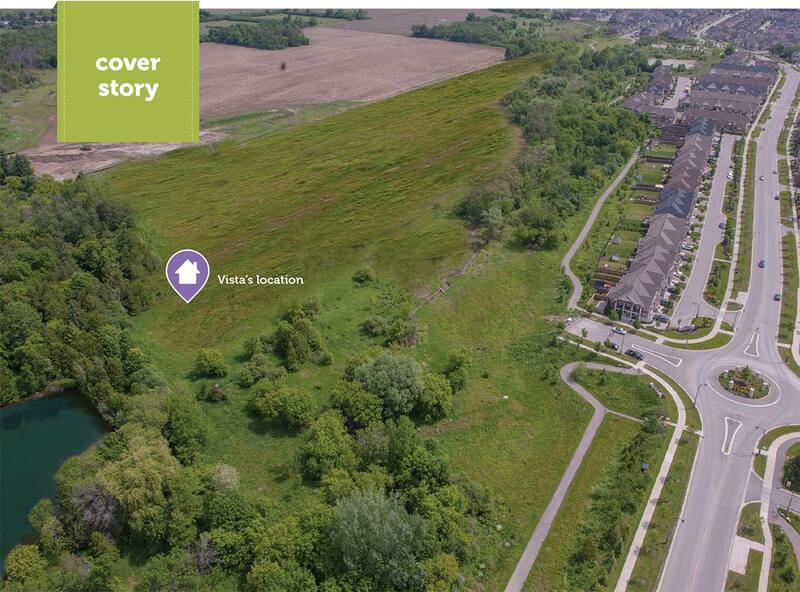 Vista is surrounded by nature, situated where the ground rises at the western edge of Geranium’s award-winning Cardinal Point, just east of Hwy. 48 and north of Stouffville Road. 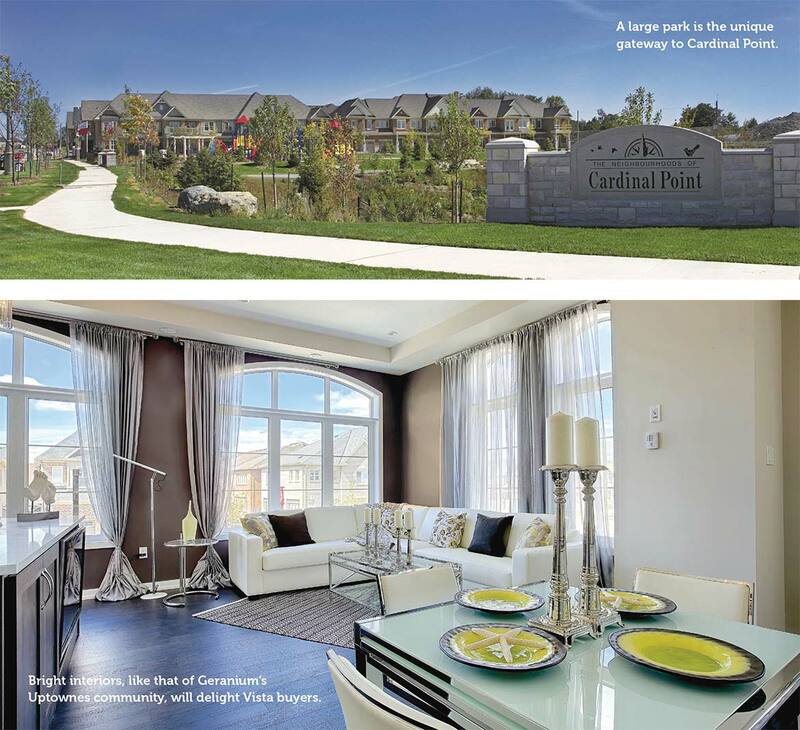 Cardinal Point is Stouffville’s “have it all” master-planned community, a place where neighbours greet each other as they walk or cycle along the 30-km trails in the natural ravine and children’s laughter is heard coming from the parkettes and playgrounds which cater to younger residents. Soccer games are often played in the large central park, also a favourite destination for dog walkers. be built with Geranium’s superior construction materials and include quality interior finishes. Residents of Vista will find getting around easy; buses run along Millard Street a short walk from the homes, and frequent GO Train and Bus service from Main Street into Union Station takes approximately one hour. Vista is also close to Hwys. 404 and 407. A variety of quaint restaurants, shops, services and a weekly farmers’ market are arrayed along Stouffville’s Main Street. Larger brand name stores such as the Metro, LCBO and Shoppers Drug Mart are just a few minutes’ drive away. organized programs at the Leisure Centre to the many golf courses and kilometers of cycling and hiking trails surrounding the town.